Ants are not exactly known to be nice to their neighbors. However, not all species solve their problems with violence. Indeed, some ants try to exploit their neighbors instead of killing them! Enter the slave making ants. 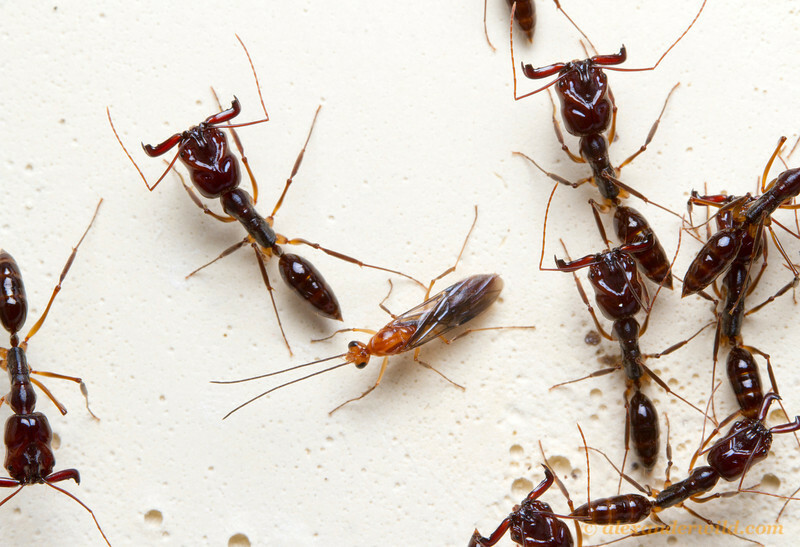 These ants actively enslave other ants to do their bidding. There are several ways of doing this. In some species a parasite queen will infiltrate the colony of another species, sometimes killing the resident queen in the process, and take over the colony. Here she will lay eggs, which will be reared by the slave workers. In the end the colony will consist of two species of worker ants, the slaves and the newly born children of the queen. The limited supply of slave workers will die of age at some point, after which the colony will consist of only the slave making species. Another way of enslaving is by raiding. Here, slave making ants will raid another colony and steal its pupae to bring back to their own colony. The workers inside these pupae have no idea what happened, and once they eclose, will start working in their new home as if nothing ever happened! Why am I telling you this? Well, there are many interesting stories to be told about the world of slave-making ants, and the coming weeks I’ll focus on some interesting stories regarding this fascinating behaviour. And every story needs an introduction first! In most ants, colonies consist of one or several queens and many workers. The queens take care of reproducing, while the workers…work. These workers are mostly sterile, unable to mate and lay eggs. 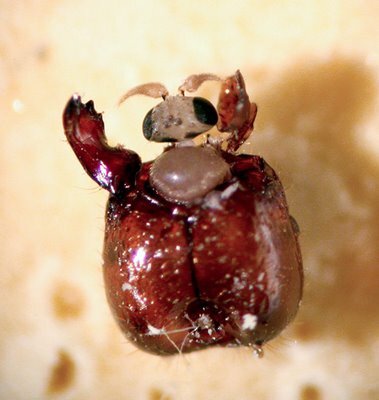 However, in some primitive ants, such as Diacamma, all individuals are born with fully working reproductive parts, but only one these individuals acts like a queen (although scientists call her ‘gamergate’ instead of queen, as she was originally a worker). Unfortunately for the rest of the workers, this gamergate wants to be the only one that does the reproducing, as the others should work! How does she make sure the rest of the workers don’t reproduce? 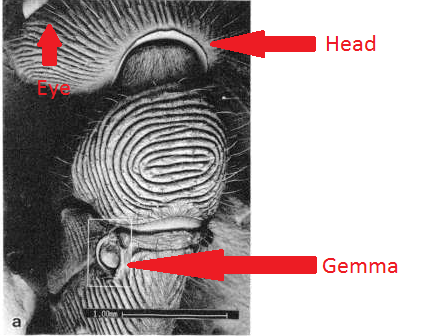 Well, fertility in these ants is governed by bladder-like structures growing out of their body called gemmae. When a young ant comes out of its pupa, she will soon be grabbed by her legs and held down by a couple of her sisters so she can’t move. Afterwards, the gamergate comes in and mutilates the poor worker, biting off her gemmae, ensuring that she will just work and will never reproduce. This ensures that there will always be only one reproducing individual. If she dies, the first worker to come out of the pupa after that does not get mutilated, and will immediately start mutilating all the workers that get born after her, and become the new gamergate. Such is the game of ant-thrones. How do we prevent ourselves from crashing in to opposite traffic while driving on very narrow roads? We put down traffic lights, and let people drive back and forth in groups. This way, everybody can get where they need to be without crashing in to each other. Lasius platythorax ant walking through a narrow tunnel. It turns out that ants solve this problem in exactly the same way (minus the traffic lights…unfortunately)! Indeed, when ants have to navigate through a very narrow space in order to get to their food and bring it back to the colony, they don’t just start walking whenever they want, as that would result in everyone bumping in to each other all the time. Instead, one group waits on one side for another group to pass by, after which it’s the first group’s turn to start walking. By alternating their back-and-forth traffic, they make sure that nobody is crashing in to each other, saving a lot of precious time! Ants are known for their extremely cooperative behaviour. Working together they are able to build nests containing many millions of workers, invade houses and transport prey many times the size of themselves. However, not all ants are always so efficient! 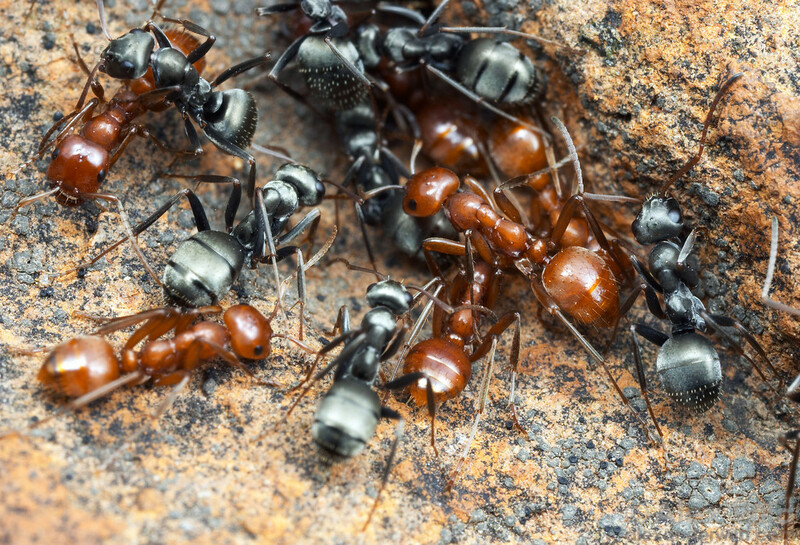 Formica schaufussi ants have scouting workers that are on the lookout for food. Once one of these scouts finds a prey too large to be retrieved by herself, she tends to recruit her nestmates and organize a cooperative prey transport. However, these nestmates don’t seem to be very motivated at all to bring this prey home! Researchers Simon Robson and James Traniello found that if you remove this organizing worker while everyone is working together to retrieve the prey, the rest of the workers abandon the prey and just return to the nest. Seems like these ants don’t like to work when the boss isn’t around! Not all ants eat the same things. 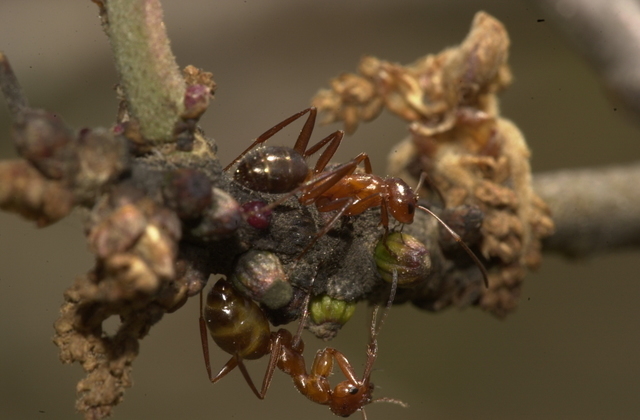 Some hunt, some scavenge, others grow their own food, and some steal from other ants. Today I’m going to write about the stealing kind. 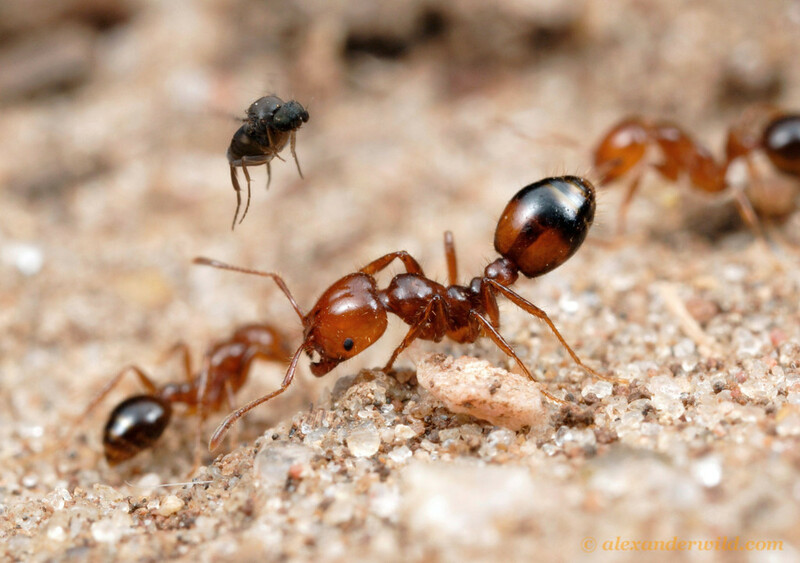 Enter Solenopsis fugax, appropriately named the thief ant. 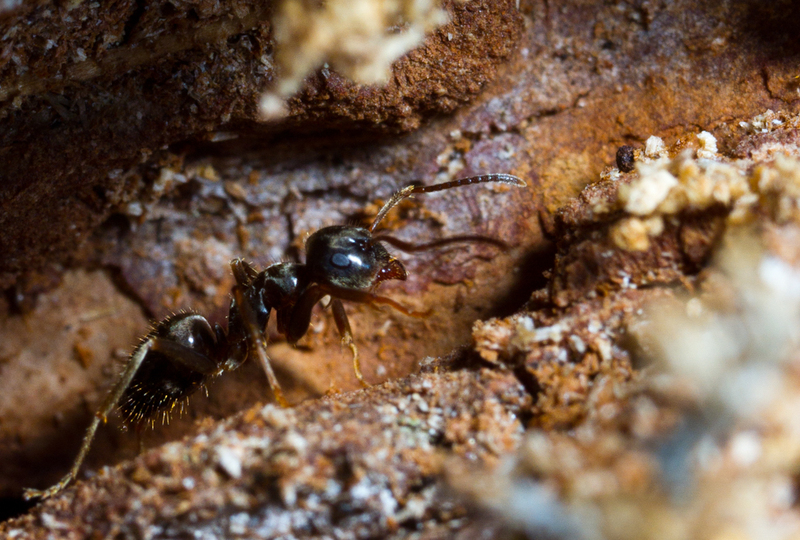 These ants are extremely small, and have a habit of making their nest in the walls of other ant species. Their favourite food being the brood of those species is bad news for the hosts. 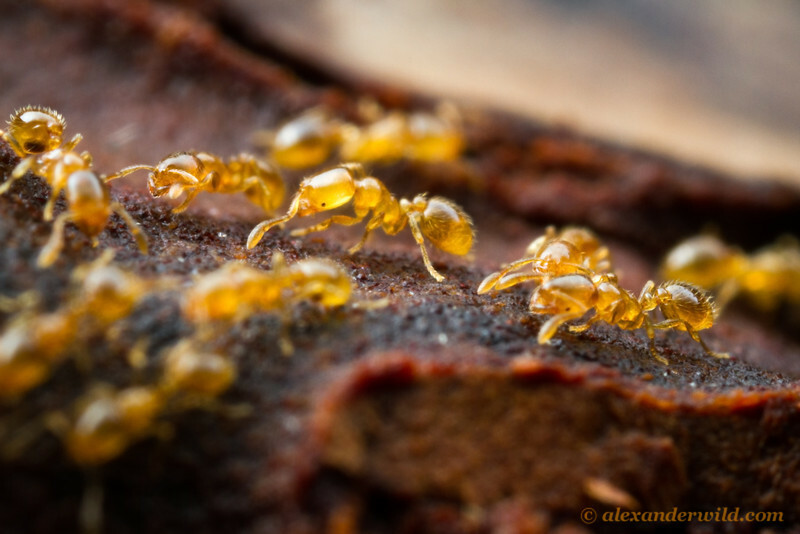 Scouts of the little thief ants make an elaborate tunnel system leading to the hosts’ brood chamber. Once these tunnels are finished, the scouts will recruit many of their nestmates in order to invade the brood chamber. Here they will steal a lot of the brood and drag it through the tunnels back to their own nest. These tunnels are too small for the victims to go through, giving the thief ants an easy time. Why don’t the victims just attack the thieves while they’re busy stealing then? Well, the thieves won’t let them! Immediately when they invade a brood chamber, they secrete a pheromone, which is extremely repellant to other species. Basically they make the brood chamber smell so terrible, that the victims don’t dare to enter! So basically they’re robbing a shop in broad daylight, and getting away with it every time! Even though ants are extremely interesting creatures, sometimes there’s just too many of them. One of the best examples is the Red imported fire ant (Solenopsis invicta) in the United States. This ant was accidentally introduced from Argentina somewhere around the 1930s, and has gone on a rampage since then. In Argentina they had plenty of enemies to keep them in check, but these enemies don’t live in the US, allowing the ants to spread without much resistance. This effect is known as ‘enemy release’. The ants themselves are quite small, but they are extremely aggressive. They don’t only compete with the local ants, but they also invade buildings and sting people, which can result in an allergic reaction and if you’re very unlucky, even in death. All in all they cost billions of dollars every year to the US. So…what can we do about them? Researchers have been trying hard to find ways of getting rid of this ant, and one of them is pretty promising…but also quite gruesome! Enter the tiny parasitic fly Pseudacteon. Peudacteon fly trying to find a suitable ant to parasitize. Picture by Alex Wild. This fly injects an egg into a Fire ant. This egg will hatch into a larva, which will migrate to the ant’s head, after which the head will fall off. The larva will then eat the insides of the head and use the head capsule as a pupal case. Afterwards it will turn into a fly, ready to complete the circle. Pseudacteon fly emerging from Fire ant head. Picture by Sanford D. Porter. Scientists have been bringing these flies to the US to fight the spread of the ants. Exactly how efficient they are at keeping these ants at bay is not known yet, but the flies seem to have no problem in establishing themselves, meaning they are definitely doing their job! Porter SD (1998). Biology and behavior of Pseudacteon decapitating flies (Diptera: Phoridae) that parasitize solenopsis fire ants (Hymenoptera: Formicidae). The Florida Entomologist 81(3) 292-309. Ant males are normally a very overlooked type of ant. 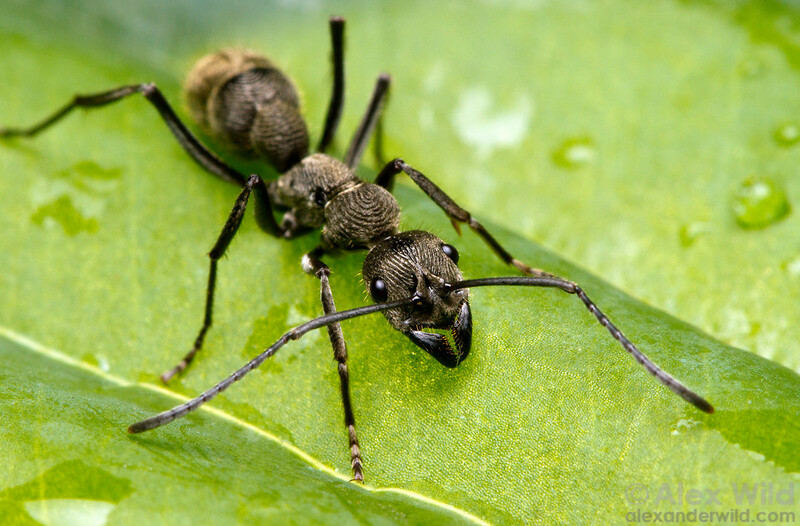 They generally don’t look much like an ant at all (see for example Alex Wild’s ant male pictures), don’t go outside except for mating, and die immediately after mating, making them not very conspicuous at all. However, very interesting things happen in the world of an ant male! For example, in the ant Cardiocondyla obscurior, colonies generally consist of many queens, and mating often happens inside the colony, leading to inbreeding. However, males will have to compete for the females. In C. obscurior, two different kind of males exist. First there are the wingless males that are always fighting each other to the death with their sabre-shaped mandible in order to get access to queens. The second type are winged males that behave very peacefully and don’t have dangerous mandibles either. Funny thing is, these peaceful winged males are normally just as succesful in mating with queens as the wingless aggressive males. So…what prevents the aggressive wingless males from killing the peaceful winged ones? It would surely be beneficial for them right? Well…yes…if only they could recognize their winged competition! You see, ants normally recognize most things in their life by smell. The winged males actually managed to change their smell in order to smell like female queens! This results in the aggressive wingless males being unable to recognize them, and thus unable to kill them. Unfortunately for the winged males, smelling like the queen has one slight disadvantage…wingless males keep trying to mate with them! However, this is a small prize to pay in order not to get killed by them instead. Cremer S, Sledge MF, Heinze, J. (2002) Male ants disguised by the queen’s bouquet. Nature 419:897.